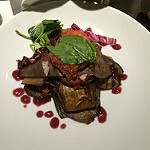 You may have already seen my last post on fab vegan food on Princess. But maybe you’re thinking Princess isn’t quite your thing and you want a livelier, more active and a more ‘happening’ cruise. Something like Royal can offer, especially if you have kids. Or if you’re young and want a cruise with other young cruisers (friends, couples) onboard. 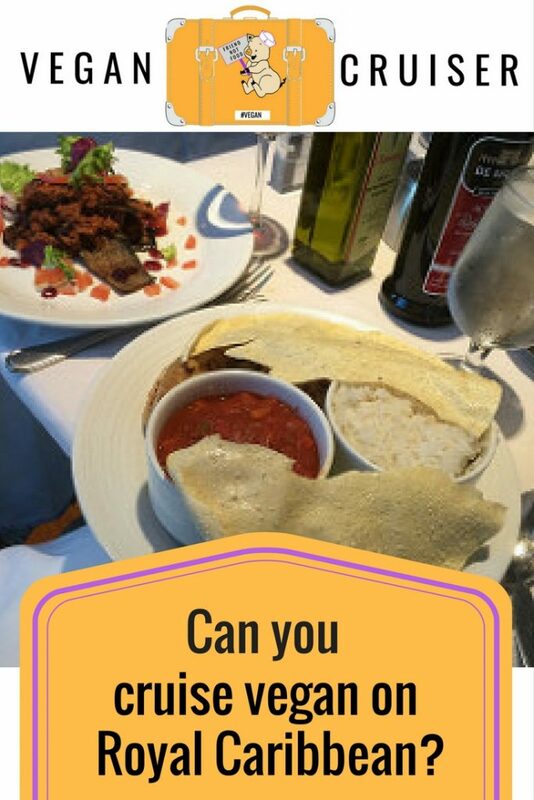 But, your question probably is.. can you cruise vegan on Royal Caribbean? Will they cater for allergies and other dietary needs? I have, technically, had one and a half vegan cruises with Royal Caribbean in the last 18 months. 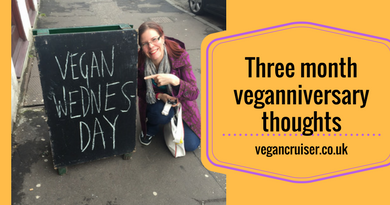 During the first cruise, I was dairy-free only, while MrVegancruiser ate vegan and I observed how well he was catered for. Then I had my own vegan sailing last summer and I will be sharing some of my photos here today. 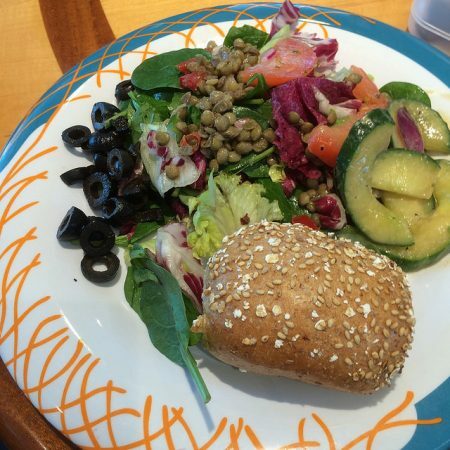 Royal Caribbean (RC) like many other cruise lines make no mention of the vegan diet on their website. Fear not. If you contact RC customer services via e-mail you may get a rather curt response stating their ships “don’t offer vegan meals of any kind” whilst advising you to speak to the maitre’d upon boarding to see what they can provide for you during your cruise. 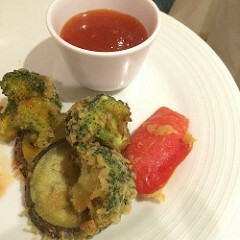 But they do offer vegetarian and Indian vegetarian meals and they can adapt dishes so you can expect to be fed. It all depends on the inventive mind, skill and interest of the chefs looking after you. For those of us in Europe, like myself & MrVegancruiser, Royal Caribbean wants dietary notice 90 days before departure. So once you’ve booked, e-mail customer services (RC have a UK special services e-mail) to confirm notice of your vegan request. I always contact them via e-mail to ensure there is a soy milk note against my name and to make sure there is a record for demand for vegan options. What I have learned from my previous cruises is that disappointingly, RC do not offer a range of plant milks, only soy. They also have no dairy-free spread. The choice served onboard is either butter or ‘healthy’ plant spread that isn’t vegan (or dairy-free). On our Princess cruise, we took some dairy-free spread onboard with us. Unfortunately, both of my vegan RC cruises were on smaller, older ships, and the cabins had no minibar to store refrigerated items. Check the ship you are considering/have booked to see how your cabin is equipped. I resorted to using breakfast fruit, portions of jam or baked beans on my on my breakfast bread. 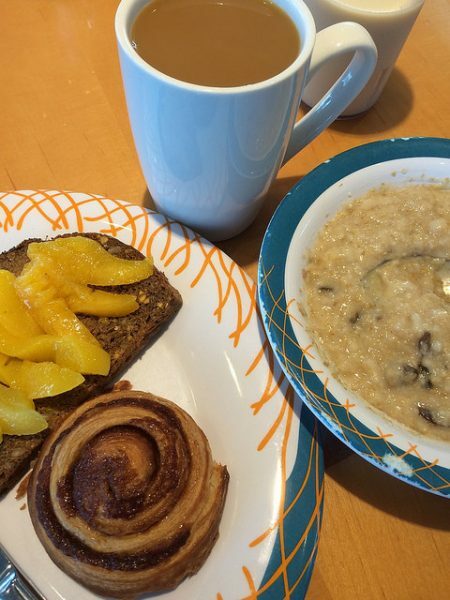 And having spoken to the Windjammer buffet supervisor, I discovered the cinnamon swirl pastries served on our sailing were ‘accidentally’ vegan much like the UK supermarket JusRoll cinnamon rolls are. They ended up being my dessert/treat in addition to the Oreos I brought with me. Of course there always was lots of fruit available, but I am not a ‘fruit for breakfast’ person. Peaches on rye bread does actually work! It may sound totally odd but I ended up really enjoying this combo. Soy milk I always had to ask staff for, behind one of the serving stations each morning. I would get a glass that would do for my daily caffeine addiction cure. 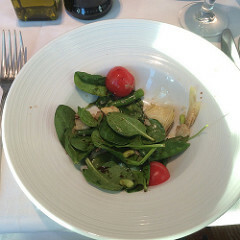 If you have read my posts from pre-cruise you know I was querying pasta onboard before our sailing. 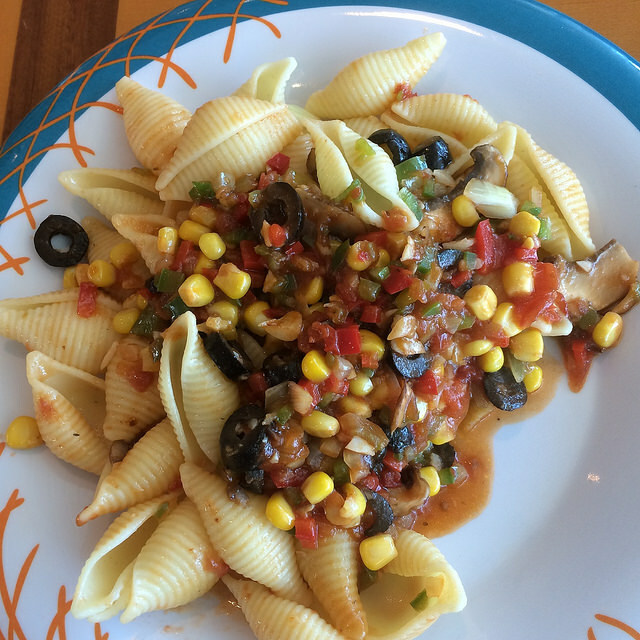 MrVegancruiser on our sailing would not be served pasta as the head waiter insisted it was all egg pasta onboard. I struggled to believe it, so had the customer service team to confirm this. The reply that came back from Vision OTS was that pasta in most cases had no egg, but had a ‘may contain egg’ warning. For most vegans, this is an allergen warning and an acceptable item to eat. So I was happy to tuck into the pasta in the buffet and it gave me more choice for lunch. I could select vegetables from the salad bar and have those with the pasta & sauce from the choose-your-own-pasta-dish station. 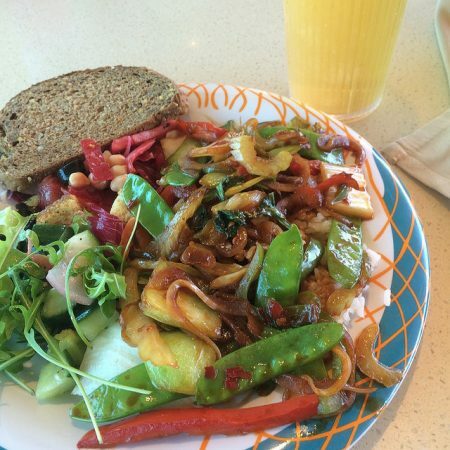 There also was a Chinese stir-fry station and although the noodles contained egg, I was able to get stir-fry veg with soy sauce to be had with salad bar items and bread. There was at least one vegan Indian curry but I do also remember seeing paneer veggie curries that I couldn’t have. Sometimes I didn’t want to re-do the pasta or chinese dishes above and the veggie curry wasn’t vegan and I ended up just enjoying the salad bar collections of veg, lentils and beans with bread. 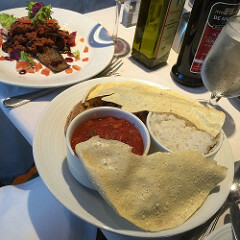 For my main course I opted for the vegan-sounding soft shell tortillas with soy chilli & vegetables but when my dish arrived there were no tortillas – and my waiter advised me that this was the vegan version of the dish. Maybe the tortillas were buttered or the packaging had another ‘may contain’ warning on them. Instead, I got a lovely grilled aubergine slices stacked with the soy chilli. It was actually really tasty and I did tell my waiter so – even if came without tortillas. 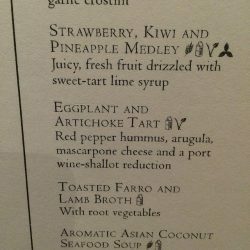 Take a wild guess what the dairy-free and vegan dessert option was? 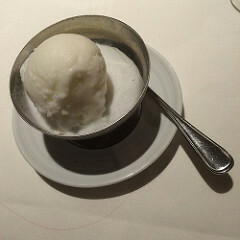 Yup, lemon sorbet. Every night our waiter would plump down a basket of bread and most rolls were covered in cheese. I would have one or two that were plain or seeded, the rest just sat there. And at the each night the head waiter would come and speak to me about options for next day. 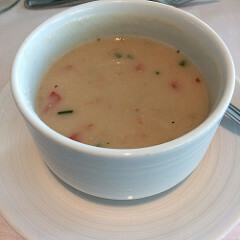 Where my husband had been able to look at the menu and see if there was anything he could work with, on my cruise I was given a couple of options to choose from for the following night. This was the most awkward of all of the dishes. On one of the nights I just fancied pasta for dinner. But the MDR chefs refused to serve it, and my waiter kept repeating ‘we serve rice noodles to vegans as they are egg free’. I explained about the ‘may contain’ warning and how I had checked it and I was fine. 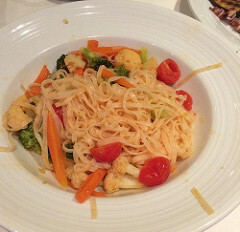 But chefs persisted so I ordered the rice noodles and vegetables. It came with no sauce, I suppose I should’ve specified that too. As you can see, there are only six photos as on the 2nd formal night we chose not to dress up. We dressed casual and ate in the buffet instead. 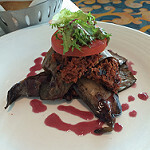 In addition to the five MDR dishes I have shown above, the 6th main course is the not-tortilla aubergine soy-mince stack that I was served on the first night. 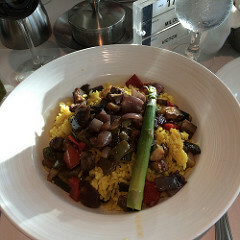 My main courses are evidence of the fact you can cruise vegan on Royal Caribbean. Both the MDR and the buffet were able to cater no problem and I was never hungry. But by the third day of the cruise, I was really looking forward to calling at Corfu and doing a cake run to Rosie’s bakery (see my post here). On night one, as seen above, I was served plain sorbet. Below you’ll find my other desserts from that week. On the second night, I was served a rather Scandinavian dessert. In Finland, you will often find fruit soup and semi-set jelly-like fruit ‘kiisseli’ served as a homely dessert or snack. 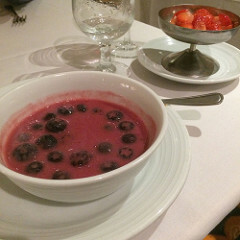 The chef had prepared me blueberries in blueberry flavoured thickened soup. It may have had some plant milk but definitely some cornstarch or similar to thicken the sauce. On the side, I had some halved strawberries. 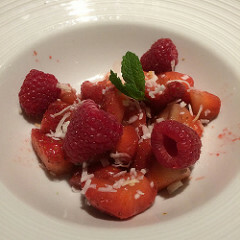 The third dessert served was raspberries and strawberries, sprinkled with some desiccated coconut and garnished with a leaf of mint. 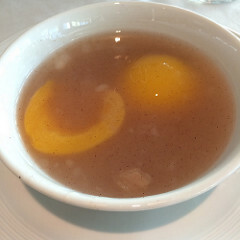 Day four brought me two peach halves in peach juice/syrup, again thickened with cornstarch. 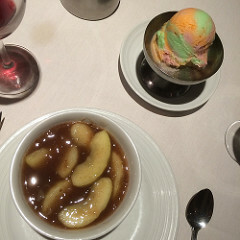 Dessert on day five was unstewed apple slices in thickened apple juice with a dusting of cinnamon. I focussed my energy in the delicious rainbow-coloured sorbet that was served with it. My dessert on our final night onboard had me fighting the urge to squeal with excitement. I couldn’t believe my eyes when a brownie-like cake with some strawberries was placed in front of me! Cake, after all the fruit and sorbet! To my disappointment, it was bitter and inedible. There was too much baking powder in the mix. It gave the cake a metallic, bitter taste. I presume chef added extra to compensate for the lack of eggs. It was good of him to try but a quick google would’ve found plenty of tried & tested vegan cake recipes kitchen could have prepared instead. Thank goodness I had my stash of Oreos. I am only hoping to educate my readers, so I hope my dessert photos haven’t put you off. I just want to make sure the vegan dessert lovers, like I am, are aware. Do use HappyCow in port for your cake fix. 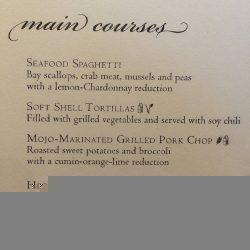 My main courses ranged from perfectly ok to great. I never went hungry during my week onboard. Neither was I thirsty. Vegan wine and cider were available, as was soy milk for teas & coffees. Would I book another Royal Caribbean cruise? Definitely. The ships are destinations in themselves, so much on even without the actual cruising. 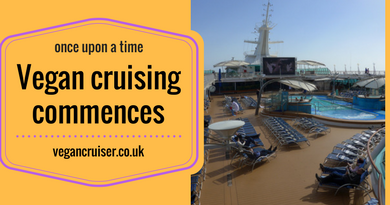 See Emma’s blog on Royal Caribbean ships for more on the ship as a destination. Do note, some of the features or venues mentioned are only available on the new ‘megaships’. Our sailing on the Adriatic was stunning – calling at amazing ports, such as my favourite Kotor Montenegro. We had fabulous weather. Our cabin was perfect for us, our inside cabin on deck 2 gave us the best rest ever (no movement, no noise). Service by our cabin attendant Ikomang was great, as were all the staff who served us during our week-long trip. Especially tbartendersers in Schooner Bar. And last but not least, we had an amazingly entertaining and humorous Captain whose talents included not just commanding a vessel but funny announcements too. And he is rather good at singing. Instead of the usual Dancing with the Officers (aka US version of Strictly) Vision had Rocking with the Officers. Captain Marek treated us to some raspy Bon Jovi (It’s my Life) and Mustang Sally. To this date, Captain Marek is the only Captain whose name I remember, from all the cruises I have taken. Why? Because he made a difference to every day with his cheeky announcements. His staff really seemed to enjoy working for him too. Plus, I have never witnessed a Captain come to the lobby to wish disembarking passengers a safe journey home. But he did, stood there as we bleeped our cards out for the final time, and wished us all well as we departed. That, my friends, was remarkable. Even if the vegan desserts onboard weren’t. Yet, I would return to this ship as everything else was great. 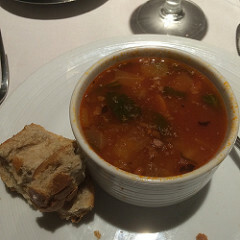 If you think you’d like a cruise but better vegan meal options, see how Princess looked after us couple of months after this Greek islands cruise. 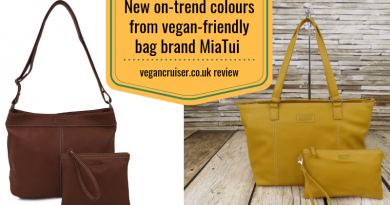 Or consider actual vegan cruises – see more info here. Any questions or comments, please do not hesitate to get in touch. Comment below, Tweet, e-mail or find me on Insta and message me. Always happy to talk cruise! 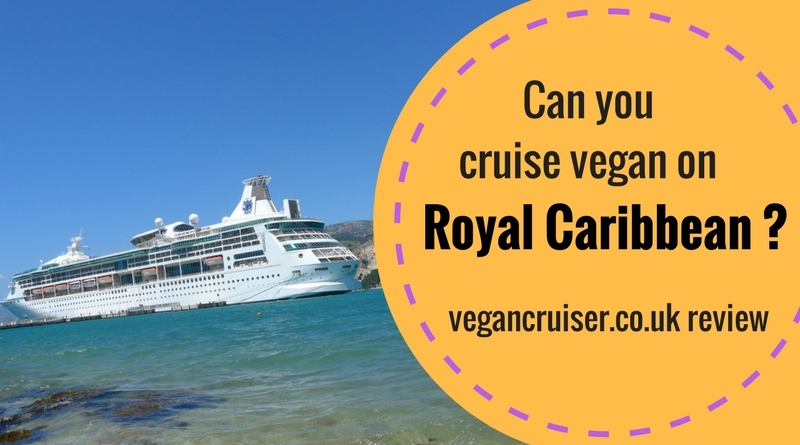 ← Can you cruise vegan on Princess Cruises? Sounds like you had a great grime and cool that they’ve been able to accommodate your food needs as well. Sounds like a definite thumbs up! Great post! I’m vegetarian and have cruised on Royal Caribbean. You’re right, vegetarian options abound but I imagine it would be challenging to find vegan options, especially when the chef disagrees with your food choices! 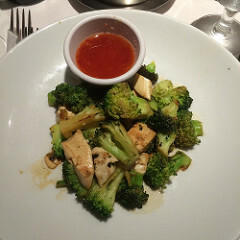 Windjammer seems to work best for our family since my husband and son do eat meat. Kudos to you for your open-mindedness and great attitude. Many others would have complained where you managed to find humour. 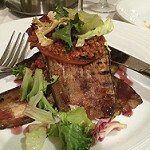 I couldn’t complain about the aubergine/eggplant stack as it was nice but a bit much to be served each night – as a 2nd main course. I did, in the end, get them to hold it as I had more than enough to eat. 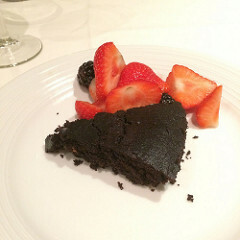 Dining vegan is not really a problem and I find the buffet the easier for mix & matching to build meals but as I did point out – desserts were the low point. Did you see my photos from Princess though? Desserts each night! Thanks for the post! 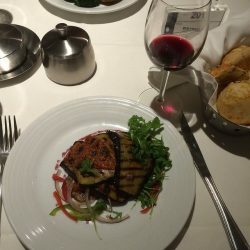 I’m looking at doing a short Quantum OTS cruise with my (also-vegan) partner and we’re hoping that the Shanghai based customers will mean less dairy/more vegan-friendly offerings. But that may not make a difference  I’m also coeliac which means even vegan breads/noodles/pizza/cakes usually have flour so the double-whammy means I often go hungry at functions and restaurants. 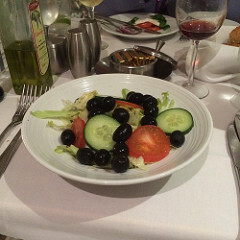 So the very idea of 5 nights is challenging….surely there will be fruits and steamed veg to live on! 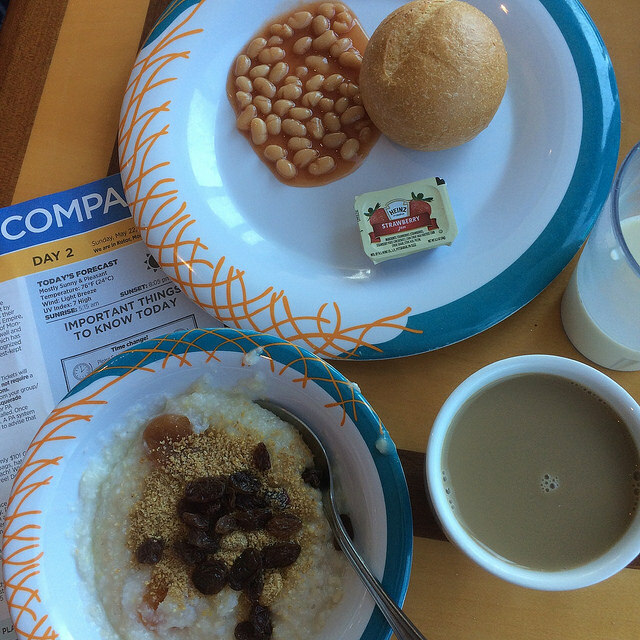 We went on the Independence of the Seas in 2016 and the vegan food was dreadful. Ordered 24 hours in advance and tasted like it had been prepared 24 hours in advance. No self respecting chef would serve what we were given. Garlic mushrooms with raw garlic, congealed noodles, yellow watery jacket potatoes. If we complained the arrogant head chef would appear and start load spouting a much rehearsed speak about how well they catered for all diest . It was a performance for all the nearby diners to hear but the food in front of us totally belied what he was spouting. I felt that the preparation of our food had been given to the person who mopped the kitchen floor. Now Cunard last year was a different story. 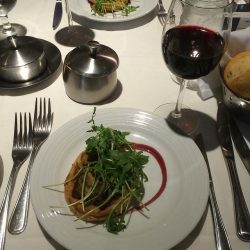 They were wonderful and the food was wonderful and obviously prepared by a real chef. Hi, we are going on our first cruise next month on Anthem of the Seas. I know this is a vegan forum but I’m hoping you can help a plain old vegetarian. We are planning on going very casual and doing the buffet alot. The problem with most buffets is labeling. I can obviously recognize bacon wrapped everything and hunks of meat but am I going to have to ask about the ingredients in everything or are there labels? It can be exhausting trying to find out if the rice or soups etc are cooked with chicken stock. Thanks in advance for any help.